In this article we explore styling and fit of jeans and pants for the curvy woman. Different brands of jeans fit differently. It'd be wonderful if there was a universal standard for the way jeans fit, but the reality is that there's not. Some may fit too loose in the thighs but feel perfect in the waist. In contrast, another pair may fit too tight in the waist but feel great everywhere else -- and both pairs might be the same size. 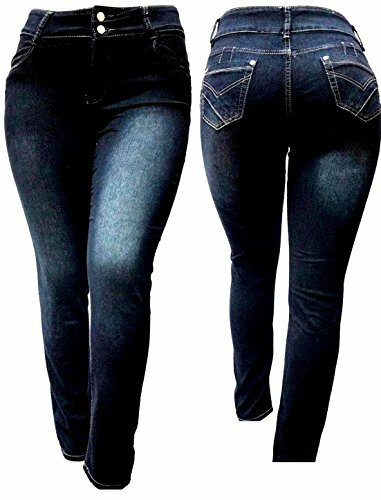 Many women find that a specific brand of jeans fits perfectly but the same size in another brand has a completely different fit. Don't settle. A good pair of pants should fit right everywhere. A woman's body shape is important when shopping for pants. Some pants are made for women more well-endowed in the hip area. Others are made for women who have more rectangular body types. It seems discouraging but rest assured that there are pants out there for women who are tall, short, slim, thick, built, and so on. The key to finding the perfect pair of pants is simple: Try them on! Bend over in them. Jump in them. Dance in them. Move around. Knowing how the material moves with your body will help you determine whether or not the pants are right for your shape. Mid-rise or high-waist pants are an ideal choice for women who have wider midsections. Pants that are too low or too tight around the waist will create unsightly bulges and muffin-top for women that carry extra weight around the midsection. Stretch is recommended as well, especially as women's weight tends to fluctuate with regular hormonal changes. Here's a quick tip to make jeans and pants last longer. Never dry them on high heat. Jeans and pants typically have at least some elasticity and when dried on high heat, the elasticity melts. This leads to pants that get saggy as the day goes on, as the elastic has lost its stretch and no longer conforms to the curves of the body. Always air dry or tumble dry your pants. If you must use heat, use the lowest heat setting possible. Remember that choosing jeans and pants is an investment as many are priced high so be sure to choose carefully and consider all the points I have raised in this article. Note: FSI is debuting its Plus Size Consultant Certification course this summer. Watch this space for details about the training lessons that will give learners vast knowledge on this subject and introduce them to the intricacies of working with the curvy woman.